The U.S. Food and Drug Administration (FDA) requires that certain information appear on dietary supplement labels. By reading the label, you can get a better idea of what you are putting into your body. It’s also wise to talk with your healthcare provider about whether you need a supplement and, if so, which one to choose. 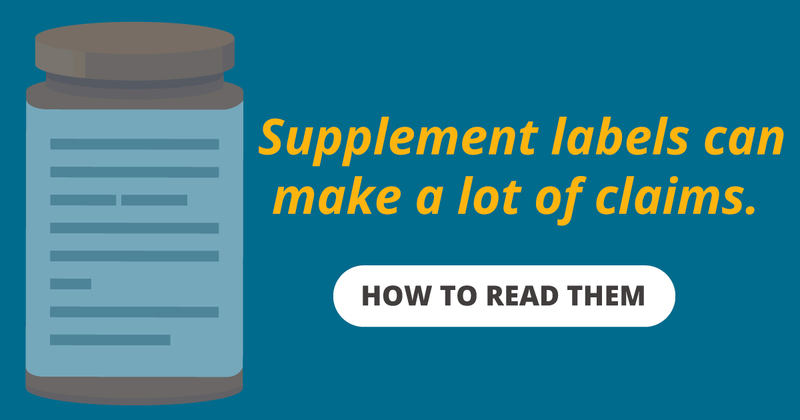 So what should you look for on a dietary supplement label? Includes the brand name and a statement that the product is a dietary supplement. The number of capsules, pills, etc., in the package. This is the manufacturer’s statement about how to properly use the product, including how much of it to take. Health claims describe how a supplement ingredient might reduce the risk of a disease or illness. Nutrient content claims describe the level of an ingredient using terms like free, high and low. Structure/function claims such as “calcium builds strong bones” describe how an ingredient is intended to affect the body. The label may contain a cautionary statement saying that the product has not been evaluated by the FDA or is not intended to diagnose, treat, cure or prevent any disease. This statement does not mean that no adverse effects are associated with the product. A list of all ingredients with amount included in each serving. If the ingredient is botanical, the label must include either the scientific or common name of the plant. A percentage of the supplement’s Daily Value, if it has been established. A list of non-dietary ingredients such as fillers, artificial colors, etc., in descending order of prevalence. Not contain the correct ingredient. Contain higher or lower amounts of the active ingredient. For advice on whether you need a supplement, and which one to choose, talk to your healthcare provider.